I’m trying to consider the pros and cons of putting my boat in a covered slip throughout the year. Here’s how I see it. A covered slip to me (while a little more expensive), may prevent me from having to pull my boat out of the water for 25% of the year. I live off the Chesapeake Bay at Solomons Island. I’d save on a haul out, shrink wrapping, and if i switch from single season to something longer lasting, I wouldn’t have to pull my boat out of the water every year just to paint. With a yearly short haul to replace zincs and inspect running gear, what are your opinions? My gel coat should last longer out of the sun as well. I see many benefits. I hear spiders can be an issue, possibly more aquatic life clogging strainers, and an obstructed view of my surroundings etc... but what else really detracts most of you from a covered slip aside from the increase in slip fee? I’d like to know what your opinions are? Only thing I don’t like is that the boat is rather dark. On the Bohemia, spiders are defiantly a problem undercover. If you wash the boat once a week, it will keep them at bay. The darkness mentioned above could be a problem depending on the slip orientation. We actually get the sun rising over our bow and flooding the master with light through 2 deck hatches. The setting sun does a good job of lighting up the salon through the rear door as well as the aft deck. The pro's defiantly outweigh the con's. My slip is covered and so is my car which I park right behind the boat. S. Louisiana sun on aluminum boat turns into an oven. Still hot underneath cover in the summer but so much better than full sunshine all day. Given the choice, I would have a covered slip. That said, I would want to examine the slip (and building), and the neighbors. It may not be justifiable, but I fear a greater risk of fire in them. Also, I have stayed as a transient in a number of them. Some are weekend party centers. 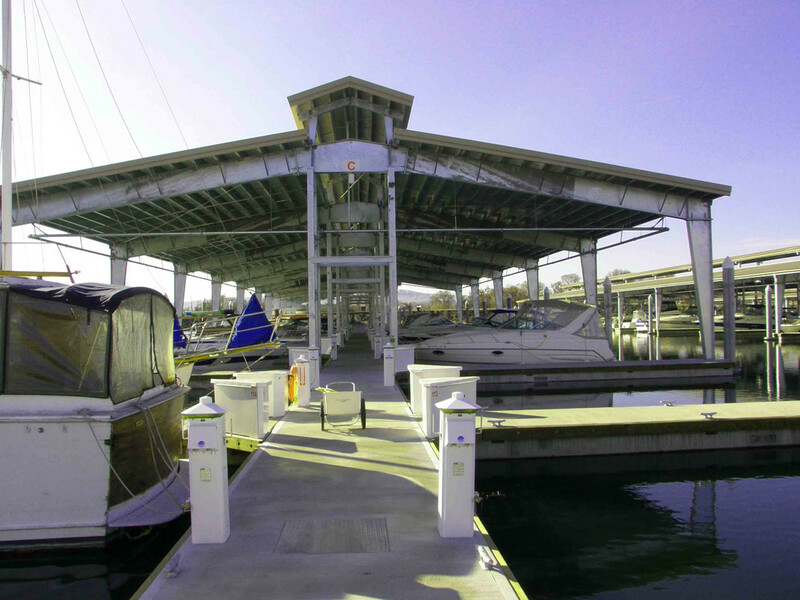 Finally, the amount of stuff that clutters the walkways can be an issue as many boat owners see the docks as covered storage. Lastly (really), check with the marina what the rules are. Barbecuing on the docks with gasoline powered boats around, makes me nervous. I kept asking boat in a covered slip for over 20 years, all positive. No spiders, less maintance and boat was always cleaner. Here in the PNW boats living in boat houses almost don’t age. Boats living uncovered have the hardest life. For me living on a boat in a boat house or in covered moorage makes no sense. While it might be cooler in summer, you pay it back in winter. Again I am talking about life in the PNW. I've bought 2 boats from owners that kept them in covered slips and they were in beautiful condition. I like the sunshine but live up north. I would feel different further south. It is pretty cool on a rainy day... stayed at a covered slip on a summer cruise and enjoyed it. Like many others I think there are more positives than negatives. The spiders and where we are, the birds can make a mess but many have hung tarps or plastic above their boats and this seems to help substantially. If you have any canvas it will definitely last a lot longer. Go for it I would say. My boat has been in a covered slip at Calvert Marina for 4 years, and there's nothing during that time that would cause me to look for an uncovered slip. The storm surge during big onshore winds that occasionally pass by raise the boat and may cause clearance concerns, but that's just something to deal with and not a significant issue. The water in the shed tends to be calmer and more likely to ice up but that hasn't been a concern either. When I was considering the slip during the winter of '15 before I brought the boat home, there was considerable ice in the slip and around the neighboring boats, but it hasn't happened since. I leave my boat in the water during the winter and haven't needed a bubbler. Another plus is that year-round liveaboards seem to prefer the shed, so there's usually someone around to keep an eye on things. If not liveaboards, then there's the ability to place wifi cameras or other sensors to keep a remote eye on things. Yes, it's darker, but that also means it's cooler during the summer months. I can't think of anything bad to say about it. If you can, do it. It just so happens that I’m looking at Calvert Marina as my choice. Thank you for that! Thank you all. Wonderful advise. I'd only avoid a covered slip if we were living aboard under there for more than a couple weeks at a time. Not that there aren't some increased risk due to roof collapses from snow or ice, or from fire. When we bought or old Hatteras, it was kept in Calvert as well, up there on the north row next to Washburn's. I wonder if the marina would be insured for something like that. Just sent you an email Greg. My boat has been in a covered slip for the last 20 and for the first 9 of its 39 yrs. It looks more like it is 15 yrs old, but much of that may be style, as everyone knows that style is not being made any more. Around SW BC, the saying is something like "pay for a shelter or pay for maintenance, it works out the same"
Not for living aboard though, unless you can easily slip out of your shelter when you want sunshine. We live in the 'covered corridor' across Tennessee and northern Miss and Ala. The difference in cosmetic maintenance between covered and non-covered is substantial, as are the opportunities for dock social activity. Spiders are an issue, as are birds attracted by spiders; so we spray regularly for spiders. In my area, covered slips typically cost 150-200% of uncovered, but worth it in my view. When they built my marina they considered the possibility of fire. In most marinas the flames run up under the roof then travel along the length of the roof and pretty soon the while damn thing is ablaze. In my marina, if the fire runs up to the roof it can escape and isn't as likely to travel laterally and catch everyone's boat on fire. That vent line that runs along the ridge of the roof is supposed to prevent the flames from passing from one slip to the neighboring slips. Spiders aren't a big problem, I use a spray called Home Defense from Ortho. I spray the docks, dock lines, cleats and most everything I can see and that prevents them from hanging out on my boat. They seem to like my neighbors' boats better. Good advise. I’ll stock up on Ortho! Heather Alyssa, for us getting the teak out of the direct sun was the primary concern. Daytime temps on the boat in the summer are cooler as well. Our open slip at the other marina had plenty of spiders. I use the same Ortho product as GFC.